Our missionThe Virginia Center for Digital History (VCDH) advances historical scholarship and facilitates active dialog between scholars, researchers and educators in the digital age. exchanges among educators with a shared commitment to transforming how history is taught, learned and accessed in the digital age. "America on the World Stage: A Global Perspective to U.S. History"
July 2009 -- Charlottesville City, Albemarle County, Greene County, Madison County, and Orange County Public Schools, in partnership with the Virginia Center for Digital History, have been awarded a Teaching American History grant by the U.S. Department of Education to provide professional development training for American and world history educators. Titled America on the World Stage, the goal of this project is to recognize the urgent practical and conceptual need for teachers to understand the emergence of the United States' power and prestige in relation to world events. The first three years of a five year proposal were approved for approximately $1M, and the final two years will be supported contingent upon Congressional support of the program in 2012. 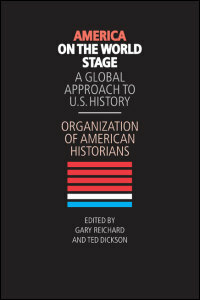 Each year, teachers will engage in a series of lectures framed by America on the World Stage: A Global Perspective to U.S. History (Organization of American Historians, 2008). Small cohorts of teacher leaders will connect these content sessions with practical guidance on bringing this international approach to the classroom, with suggested lesson plans and activities. These products will be submitted for a juried publication review, then shared with colleagues online. Finally, teachers will participate in extended summer field courses with Gilder Lehrman Institute of American History. Six representatives of VCDH projects featuring scholarship, teaching, and outreach participated in the 2009 Virginia Forum, held at Longwood College on April 24-25. Devoted to all aspects and time periods of Virginia history, the Virginia Forum brings together historians, teachers, writers, archivists, museum curators, historic site interpreters, librarians, and others engaged in the study and interpretation of Virginia history to share their knowledge, research, and experiences. Thomas Costa, Associate Professor of History at the University of Virginia's College at Wise and director of The Geography of Slavery project, presented a paper titled, "Tracking Down Runaways: Building Biographies of Bound Laborers in Virginia, 1736-1815." Costa's work will be featured on an upcoming Virginia Public Radio program, With Good Reason; check the WGR website for listings.